Shalom! It is Tu b’Av today here in Israel. This an ancient holiday that has become the Jewish “Valentine’s Day”. I went out to dinner with some friends this evening and there were many couples out and we got roses with the bill. On the way home, we then walked through a park that was having a “Nights of Love” festival with artists and food booths. As we were leaving, we noticed a backpack sitting by one of the tables. A man was asking if it belonged to us. No one claimed it and so he went and told the shom’rim (guards) at the exit. They moved everyone away and were calling the police when we left. I am sure that someone set it down and forgot it but you don’t do that here. Interestingly, this park is dedicated to all residents of Jerusalem and there were Muslims there as well. Not to begin my update with something scary, but rather to show that everyone here is aware of what is around them and acts on it. This awareness keeps us all safe. Of course, I am still working to get use to the guns. I have moved on from noticing the Uzis on soldiers to handguns on people who appear to be just your average Israeli. Very strange to me. All of that said, I feel very safe. There is security on buses and at every restaurant where I have eaten, many have gates and all search your bags. I guess is it fitting to have begun with Tu b’Av as my last update ended in the middle of Tisha b’Av. After I got my post up, I went out shopping with a friend and bought some lovely Israeli jewelry. I bought a necklace and ring at Michal Negrin and a pair of earrings by Marianna. I also bought some gifts for other people as well. We then went out to dinner with a group of people to celebrate the birthday of one of our group members, Scott. It was really nice to be helping him celebrate here away from his loved ones. The shomer (guard) at this restaurant was talking to one of the people in our group and told us that he was a Messianic Jew. I was surprised that they were here. As he was working, I assume that he lives here which I would think must mean that he is a Jew by birth. Anyway, that revelation cut short the conversation! Just so you don’t think that it is all shopping and eating – classes are going well. My Ulpan, I am in Gimmel, which, despite being the third letter of the alef bet, is the 4th level, is going well. I am able to understand most of what she says and the work we are doing has not proven to be difficult. We spend about the first 30 – 45 minutes talking about a variety of topics and this is interesting as well as a great way to build vocabulary. Today we have a long discussion about Chabad because one of the women had spent Shabbat at a Chabad Hostel in Tsfat. She was upset because they spent all of Shabbat dinner harassing her because she was not yet married at the ripe old age of 25. She kept telling them she had plenty of time but they did not agree with her. We have also discussed books, movies, and differences in cultures as well as the daily activities of us all. We are reading an article about the discovery of the Dead Sea Scrolls right now and I think I could translate it even if I didn’t know the words since I know the story so well. I am still not entirely thrilled with my Midrash class as the professor seems to think that we have to all see it his way. I enjoy the half of the class which is hevruta (study with a partner) study but the other half is really not exciting. I am actually beginning to wonder why he has us study it in hevruta if he isn’t really interested in what we discussed and concluded on our own. The classes on Psalms is good and I am enjoying the hevruta study there as well. The last two times I have worked with Rabbi Bob Maslan who is also from Seattle and we have taught together at JDS and Temple Beth Am. I missed the skills class on Haftarah trope yesterday as I wasn’t feeling well. The other class which I am taking, on Hasidic Thought, has been great. Actually, it seems that people either love or hate it. The professor is brilliant and really knows his material and gets very worked up lecturing about it. He lectures in a mix of English, Hebrew and Yiddish at a pretty high level of discourse. My friend Rachel left half way through the first lecture and has not come to the last two. Today many of us were blown away by his lecture – really moved – and Rachel said someone told her that they thought it was boring! I can’t believe that they were in the same room. He was lecturing about two Hasidic Rabbis whose writings during the Shoah (Holocaust) were saved and have been published. They had very different responses to the events through which they lived but you could see the changes as times worsened. He was quite passionate about them and it was really quite amazing stuff. I hope to be able to find at least one of the books. He translated and edited one of them and also has another book, which he edited that looks interesting. He is an amazing source of knowledge on an age that has disappeared and from which most witness no longer exist. We also had a speaker last week, Allan Sugarman, who came to speak to the whole group and then to the Legacy Heritage Fellows. Both of his talks were quite controversial and caused quite a bit of heated discussion. The first lecture was on finding a meaningful prayer experience. He spoke from the point of view of a very involved layperson. He created a loose leaf Mahzor (prayer book for Rosh Hashanah and Yom Kippur) and removed a great deal of the traditional liturgy and replaced it with more modern poems and readings. He was advocating for modernizing the liturgy and making it relevant by making it contemporary. Many people were outraged by this and I suggested perhaps some education to help people connect to the traditional liturgy would be a way to go instead. I explained about the class I teach on the Amidah and how that is my goal – that people are able to connect to traditional prayer in a meaningful way – without having to change the actual prayer. He also insulted the 20-somethings in the room by responding to their concern that he was “watering things down” to a level that would drive them away with “you don’t pay $4,000.00 in dues so I don’t really care.” He later apologized but didn’t really seem to be aware that he had said anything offensive. The second lecture was on issues in the Jewish community. He started with these horrible stories about his community – really L’shon harah (gossip). Then, after listening to our stories – good and bad – about the various organizations in the Jewish community being able to or not being able to work together stated his solution to the problem – a communal calendar online, rotating chair positions and semi-annual community meetings where everyone has a vote! It was jus t amazing how simple he thought it would be to solve these huge issues! It has been really hot here the past week. Last Thursday and Friday were the worst. Barry, who is from Raleigh, NC, said that in his paper at home it had said that the “heat index” in Jerusalem had been 113! It really felt like it. Despite the heat, we went on a very interesting tiyul (trip or hike) on Friday morning. It is a bit of a long story to give the set up but basically in the mid 1990s the Muslims asked for and received permission from the Prime Minister of Israel to build an emergency exit for a mosque that they had illicitly (the lecturer’s word) built under the Temple Mount. They hauled off a vast amount of dirt and rubble from the Temple Mount with no one looking at it. When it was discovered that this was going on, there was an outcry from the archeological and antiquities worlds but nothing was done. Fast forward a couple of years and a student of Gabriel Barkay, the lecturer and head archeologist where we were, comes to his house with a Ziploc bag full of artifacts found in a mound of rubble from the Temple Mount. There were bits of pottery spanning a few thousand years and Dr. Barkay was convinced that this was something major. He petitioned for permission to study said rubble and after a couple of years got permission. On a shoestring budget, the various mounds of rubble were all moved to Emek Zurim National Park on the Mount of Olives near Hebrew University and he began sifting through it. Much of the work is done by volunteers and after a very contentious lecture (he was critical of the governments of Israel and the US, the religious and a few other people as well – though I have to say I agreed with most of what he had to say) we all got to be junior archeologists for an hour. It was great. They do wet sifting which means that about a coffee can full of rubble is placed in bucket and then it is filled with water. This sits a few hours. You then dump it out in a sifting pan and hose it down to rinse off all of the dirt. Then you look through and see what you can find. We found pottery, bits of mosaic, glass, pieces of ossified bone and marble. They have found metal, including lots of coins. The artifacts found span 3000+ years and the three religions of Israel and testify to the various other groups that have been on the Temple Mount. It was really amazing and so wonderful to be part of a project to reclaim these artifacts, which were almost lost forever. 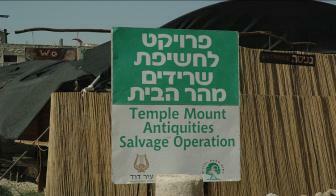 It is the Temple Mount Antiquities Salvage Project and is supported now by the City of David Foundation. A very worthwhile undertaking. I guess that is enough for now. The weather seems to be turning a bit cooler so only the 80’s this week and not the high 90’s. I am still waiting to meet my landlord. He had to have surgery like the day I arrived and has been out of the hospital but is recovering at his mother’s. He will supposedly be home tomorrow so I might yet have to pay rent! Be well!